DUOTONE Kiteboarding Team ᐅ Meet Manuela Jungo! Diani Beach, Kenya – A great spot that I have just discovered for myself recently. Wind every day and surrounded by breathtaking nature. I use the Dice with the Click Bar. It’s a very stable and direct kite that allows me to generate pop and the necessary slack to perform freestyle tricks and gives me a great constant pull on obstacles. The Team Series 135 is my choice for freestyle. It is the perfect size for me and generates pop and gives me the control that I need to improve. The Gambler 139 travels with me too. It has a durable construction and the extra rocker and grind base are perfect to hit obstacles in the kite park. Nr 5. of the World in the PKRA World Tour for 3 years. I like to do all sorts of sports. I almost can’t be without one day of kitesurfing, running, hiking, mountain biking, skiing and many other activities. I like to be in nature. If there is no wind I like to explore the place that I am visiting on foot or with the mountain bike. I like to listen to all kind of music. I started kiteboarding in 2006 in Cabarete. Duotone gives me the best gear to express myself on the water in different disciplines. 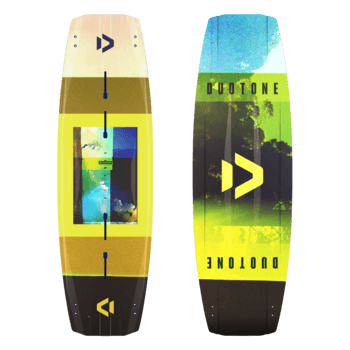 Duotone is not only a Sponsor/Brand for me it is a group of amazing group of people that I am able to spend good times with on and off the water. My goal is to keep on exploring new kite spots and to share my adventures with my community. I like to run and mountain bike to improve my endurance. I go to the Gym Bfit2 and train with my trainer when I am at home. They have amazing functional training devices like SensoPro and Fieldpower. I bring my TRX to do my strengthening or coordination training and my yoga mat for stretching exercises and to practice yoga to keep my body in balance when I am on the road. I started my career as professional kiteboarder very late. I studied economics and my last job was brand manager for a watch company in Switzerland before I started to travel. The plan was only to take a break for 1-2 years but that was 8 years ago. I guess if I hadn’t decided to explore the world I would still work for a brand in the marketing department. I am vegetarian and food is very important in my life to perform well. I like to cook myself and experiment with new recipes. Raw food and Superfood are an important part of my diet. I always like good Italian food. My goal is to show how important it is to have a passion and to believe in yourself. I also hope that I can inspire people on my trips and via my social media channels to work hard and live their dreams.